To celebrate the Salon des Refusés, he brought out a daily paper for its duration, in which he lauded the participating artists, describing Manet as one of the greatest artistic characters of this time . In 1865 he hailed the genius of Monet and was responsible for introducing him to Manet. He wrote the introduction of the catalogue of the one-man exhibition that Manet arranged in a pavilion outside the Exposition Universelle of 1867. 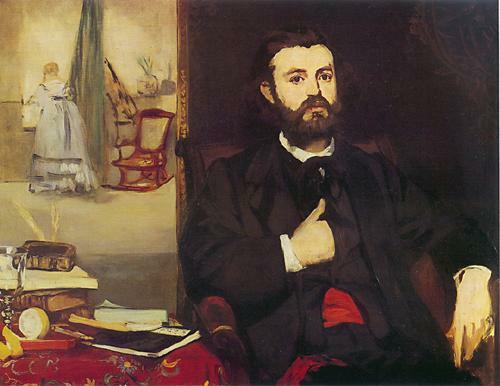 He appears seated beside Manet in Fantin-Latour's A Studio in the Batignolles Quarter (1879; Musée d'Orsay), and was painted by Bazille (c. 1869; Collection Frédéric Bazille, Montpellier) and by Manet (1866; Kunsthalle, Bremen). Astruc himself executed a bust of Manet and by the 1880s was receiving recognition as a sculptor, his most popular work being the Mask Pedlar (1883) in the Luxembourg Gardens. 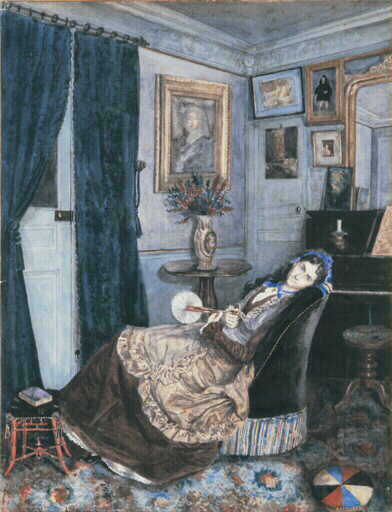 In an Paris appartment, a woman in an armchair looks towards the spectator. Many paintings cover the walls; a mirror is located above the piano. The painting above the flower vase could be a reduced version of a painting from Esteban Murillo (1618-1682) representing a Spanish portrait during the golden century. 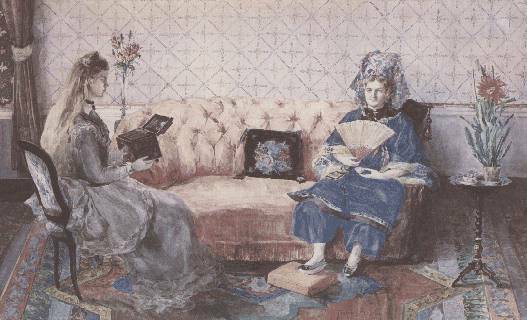 This Zacharie Astruc watercolor was presented at the first Impressionist exhibition in 1874, in the office space left vacant by the photographer Nadar, 35 boulevard des Capucines in Paris. This work was number 3 in the notice, which listed six watercolors among which only two are currently located, this one and The Chinese Gifts (London), now belonging to a private collection in New York.